Australia’s marine protected areas look set to be slashed by the federal government, with plans announced for cuts that go beyond those recommended by a review commissioned by the previous Abbott government. Draft management plans released by the Director of National Parks on Friday propose that large areas of Queensland’s Coral Sea, as well as off the coast of Western Australia, the Northern Territory and New South Wales, will lose or have their protection downgraded, to make way for expanded long-line fishing and seafloor trawling – which have been shown to damage the conservation value of the oceans. Big reductions in no-take zones have been planned in the Coral Sea, far more than the cuts recommended by the Abbott government review. Under earlier plans, only 46% of the coral sea would have been open to fishing, but under the new draft plans, 76% will be. Overall, areas that allow fishing have been expanded from 64% in the Abbott-commissioned review to 80% in the new draft plans. Conservation groups have voiced concern over the cutting of strongly protected no-take areas in the Coral Sea area. In other areas, strongly protected no-take areas were pushed further offshore, away from conflict to areas of lesser conservation need. "In November 2012 Australia declared the world’s largest network of marine parks to protect the most biodiverse waters on the planet. The marine parks provided protection for six of the world’s seven species of sea turtle, feeding grounds for the blue whale, huge schools of big fish like tuna and marlin, and precious coral reefs teeming with life. The marine parks network covered 2.3 million square kilometres from the cool temperate waters of the South-West to the tropical waters of the Timor and Coral Seas. Special places like the Perth Canyon, underwater mountains of the Coral Sea and seagrass meadows of the Top End were protected in marine parks. The process to establish the network of marine reserves had bi-partisan support and was initiated under the Howard Government with the final marine parks declared by the Gillard Government. Six rounds of public consultation were conducted and over three quarters of a million people provided submissions into the marine parks process. The final network of marine parks was supported by 70 per cent of Australians, making it one of the most popular decisions of our time. Prior to the 2013 federal election the Coalition announced it would 'suspend and review' the marine parks if elected. In December 2013 the Abbott Government announced a "redrafting" of management plans." 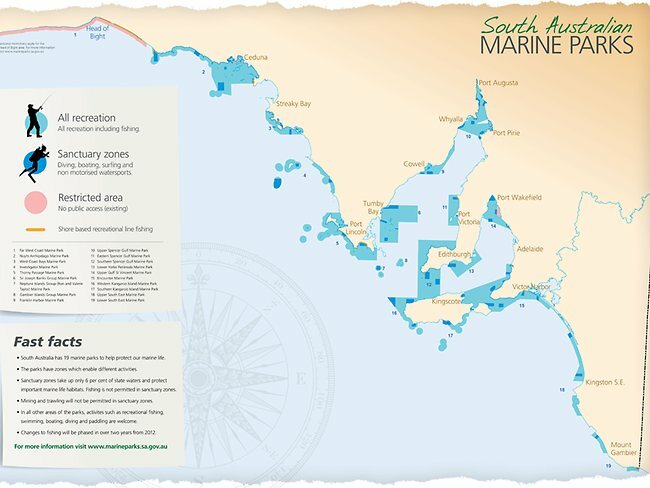 October 1, 2014 South Australia enacted fishing restrictions in their marine park sanctuary zones. The creation of 83 new sanctuary zones within 19 marine parks around the State was the product of 10 years of research and planning. In an effort to build resilience in fish stocks and preserve the marine wonders of South Australia, the sanctuary zones prevent fishing in the State’s most iconic tourist attractions: cage diving with great whites at the Neptune Islands, sea lions at Kangaroo Island's Seal Bay and whale watching at Head of Bight. And with a smartphone application to alert fishers when they are approaching sanctuary boarders, the State is dedicated to these special waters. The Sea & Me from Bluebottle Films on Vimeo.